The New York Times was outraged, and so was Sen. Kamala Harris of California. Back on Jan. 24, Senate Majority Leader Mitch McConnell submitted a cloture motion for the Pain-Capable Unborn Child Protection Act. The act, which passed the House last fall, would have prohibited killing "unborn children 20 weeks or older." McConnell's call for cloture meant that on Monday, Jan. 29, the Senate would vote on whether to end debate on the bill and move to a vote on the bill itself. But that would need a 60-vote majority. On Sunday, Jan. 28, The New York Times editorialized in favor of maintaining the legality of killing unborn babies who are 20 weeks or older. The editorial ran under this headline: "The Gathering Threat to Abortion Rights." "Mr. McConnell is set to hold a procedural vote this week on a bill that would ban abortion at 20 weeks of pregnancy," The Times said. "The so-called Pain-Capable Unborn Child Protection Act, sponsored by Senator Lindsey Graham, a South Carolina Republican, is part of a long-term legislative effort by the anti-abortion movement to gut Roe v. Wade and severely curtail abortion access nationwide." "People who care about basic American freedoms should be grateful to the Senate majority leader, Mitch McConnell, for one thing: He has given liberals another good reason to flock to the polls in November," The Times said sarcastically. On Jan. 26, the Friday before The Times ran this editorial, Sen. Harris issued her own call for action. She tweeted: "Republicans have scheduled a vote Monday on legislation that would ban some women's health care choices. We can't turn back the clock on women's reproductive health. Call your Senators now and tell them to vote NO: (202) 224-3121." The actual text of Harris' tweet included police-siren emojis at the beginning and end of the first sentence -- which also was not punctuated with a period. On Jan. 29, the cloture vote failed 51-46. Now jump forward to this past Friday. That is when Zachary Terwilliger, the U.S. attorney for the Eastern District of Virginia, unsealed a criminal complaint charging Russian national Elena Alekseevna Khusyaynova for "her alleged role in a Russian conspiracy to interfere in the U.S. political system, including the 2018 midterm election." Khusyaynova, the U.S. attorney's office said in a statement, "served as the chief accountant of 'Project Lakhta.'" FBI Special Agent David Holt filed an affidavit in support of the criminal complaint. It detailed some of Project Lakhta's activities. "Since at least May 2014, Project Lakhta's stated goal in the United States was to spread distrust towards candidates for political office and the political system in general," said the affidavit. "The conspiracy," the affidavit said, "has sought to conduct what it called internally 'information warfare against the United States of America' through fictitious U.S. personas on social media platforms and other Internet-based media." "The conspirators' activities did not exclusively adopt one ideological viewpoint; they wrote on topics from varied and sometimes opposing perspectives," said the affidavit. They created some Twitter accounts designed to appeal to conservatives and some to appeal to liberals. On Sept. 6, 2017, the affidavit said, Project Lakhta created "the Twitter account '@JemiSHaaaZzz.'" This and another account, it said, were used "to post on many of the same controversial social and political topics from a perspective that they believed would resonate with a liberal audience in the United States." "On or about January 26, 2018," the affidavit said on page 33, "a member of the Conspiracy used the Twitter account '@JemiSHaaaZzz' to repost a Tweet about a Senate vote on reproductive health issues, referencing the telephone number of the U.S. Capitol switchboard: ..."
After the above colon, the affidavit provides the verbatim text of the tweet made by this "member of the Conspiracy." It matches the text of Sen. Harris' Jan. 26 tweet verbatim, including the police-siren emojis before and after the first sentence. Twitter searches this Tuesday afternoon using the text of the Russian tweet published on page 33 of the affidavit turned up Sen. Harris' Jan. 26 tweet -- and other tweets that appear to have retweeted or reposted Harris'. A search also showed that the @JemiSHaaaZzz Twitter account has been suspended. I contacted the U.S. attorney's office to ask if it would confirm that the tweet the affidavit says was reposted by the Russians on Jan. 26 was in fact Sen. Harris' Jan. 26 tweet. The office would not comment. I contacted Sen. Harris' office on Tuesday afternoon to ask if she had any reason to deny or doubt that the tweet the U.S. attorney's affidavit says the Russian Project Lakhta reposted on Jan. 26 was in fact her tweet. By the time I filed this column on Tuesday evening, her office had not responded. There is no reason for Sen. Harris to have known that the Russians were using a tweet identical to her own -- for their own purposes. And perhaps there is some other explanation for why Project Lakhta reposted a tweet that matched Sen. Harris' other than that the project simply reposted hers. 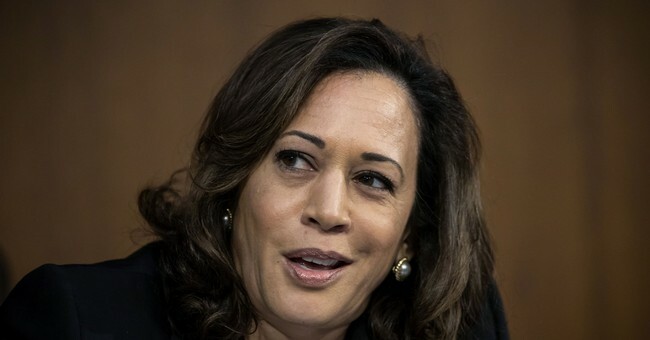 However it came about, Sen. Harris and what a federal prosecutor alleges was a Russian conspiracy were both advocating this past January against banning late-term abortions in the United States.